Shift Happens! A shift in vocabulary, that is. As you know, when the Common Core Standards in English Language Arts were released, we all learned about the Instructional Shifts. As you read about the Common Core and the changes it brings, you’ll see two basic lists of the shifts – one with three items and one with six. The list with 3 shifts simply combines some of the shifts. I prefer to keep the shifts separated, as shown below. In case you’re wondering whether or not the shifts matter, I want to let you know they do. All six of them. But as with anything, you’ll have to figure out how to use them and make them work for you in your school or district. When thinking about the shifts, there are at least a few times and ways you can use them: (1) Develop curriculum, (2) Design high-impact lessons for students, (3), Design aligned assessments to the college and career readiness standards, and (4) Design professional development experiences for teachers and administrators. Now, I want to share each of the shifts with you – one at a time – in hopes there’s a thing or two you can use. Today’s shift is Vocabulary. In using my shift pages, you’ll want to know how I’ve set them up. I’ve designed a format for beginning to think about each of the shifts. The following visual, How the Shifts Are Set Up, shows my logic in thinking about the shifts. Take a quick look. After a quick description of the shift, you’ll see two areas: one that provides hints for curriculum and another that provides hints for instruction and the possible professional needs of staff. By way of example, there’s a shift that speaks to text-based answers. It’s a standard in the curriculum – and teachers need to understand what it means. We all need to understand what it means; it’s even being tested as part of the redesigned SAT. Remember, evidence is king in the CCSS – so I chose it for the example. Now, take a look at Shift 6, Vocabulary. I chose to present this one to you first as so many schools and districts are focusing on vocabulary development. If you’re working on curriculum at the district, school, or classroom levels, there are a number of ways you can provide support for academic vocabulary. Place vocabulary throughout lessons, where appropriate, rather than at end of units. Identify core vocabulary . Use sources such as SBAC, PAARC, Tier II, and Tier III words. Provide content cards where needed. Provide a list of core vocabulary words and corresponding descriptions for units. I so hope some of these ideas will be helpful to you as you support schools in improving achievement. 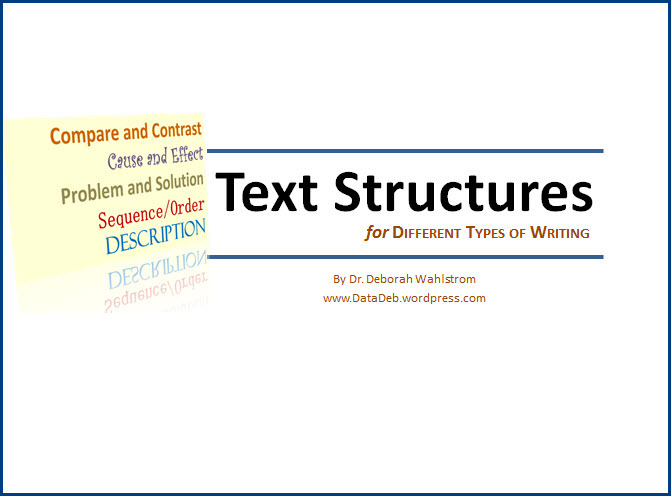 Today’s post is Text Structures for Different Types of Writing. I designed this tool for teachers, but there are many pages that will also be good resource materials for students. In this handy guide, you’ll find a quick overview of the text types (i.e., Argumentative, Informational, Narrative) in the Common Core State Standards. AFter that, I’ve included my content cards for the following five text structures: compare/contrast, cause/effect, problem/solution, sequence, and description. 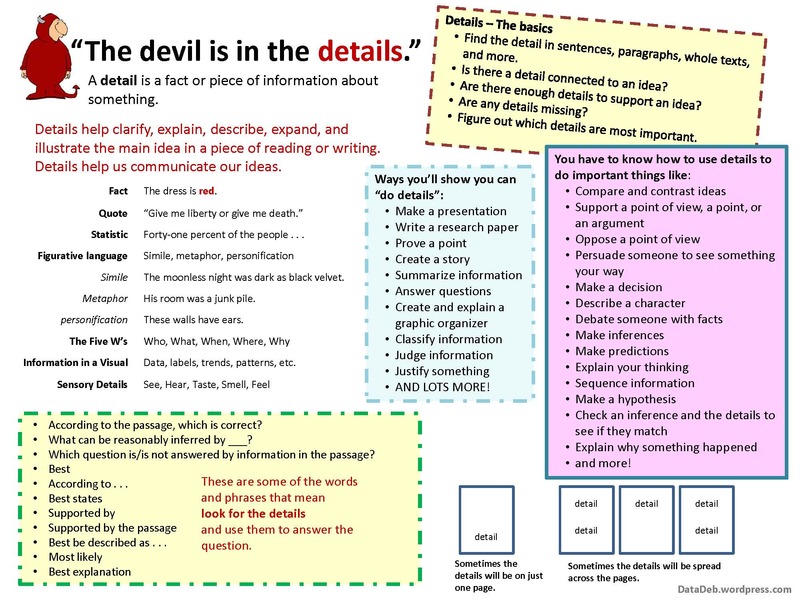 Details and examples are one of those areas that students have struggled with when writing. Being able to cite details and examples is a skill that is valuable in reading, writing, thinking, and speaking. What are some of the things we might want to make sure students learn when we ask them to think about details and examples? We might want them to know what kinds of things are details: facts, quotes, statistics, firgurative language, the information in a visual, sensory details, and more. We also want students to know some of the things they can do with details: compare and contrast ideas, support a point of view, oppose a point of view, make a decision, describe a character, make inferences, make prediections, and more. As always, I’ve got a pdf copy for you – just print it out and share it with your students (and fellow educators). I’ve been working on collecting ideas for content-area literacy. I began with the reading standards for science, grades 9-10 from the Common Core State Standards. Download a pdf version of the 28-page document and see if there’s an idea or two you can use. 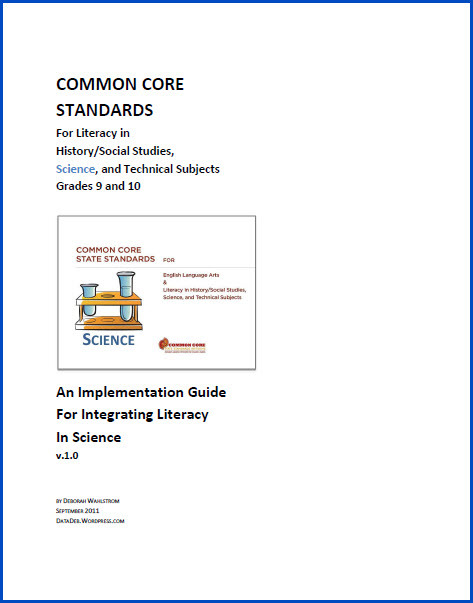 Informational Literacy Standards for Science – FRESH LINK, Updated September 27, 2011. 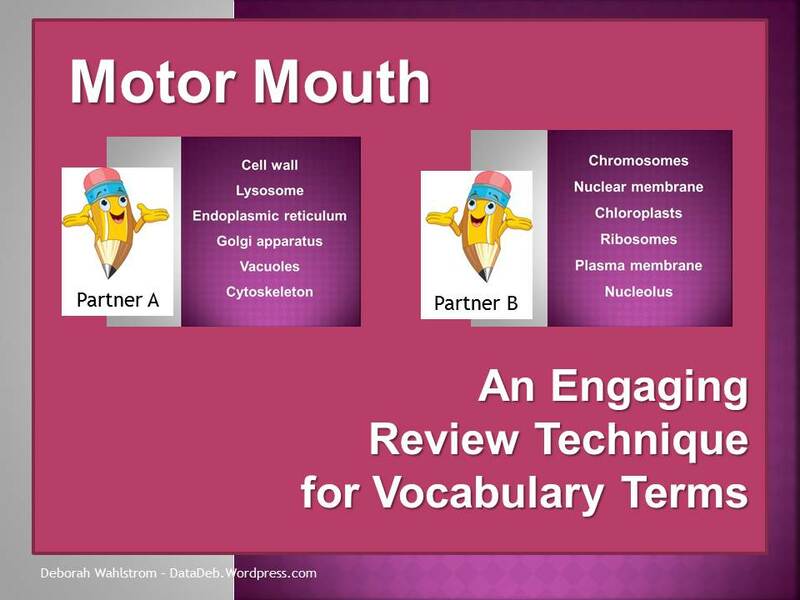 Motor Mouth is simply an engaging strategy for students to review important vocabulary. This can be used in any class at any grade level. Did I mention that this is also fun? I’ve included the PowerPoint with directions and a template that is ready to modify for your own use. Click here for the Powerpoint! Writing is a tool for thinking and learning. It doesn’t matter what content area you teach, you’ll find many opportunities to help students think through writing. This quick overview gives a couple of ideas for having students write about data from a line graph. 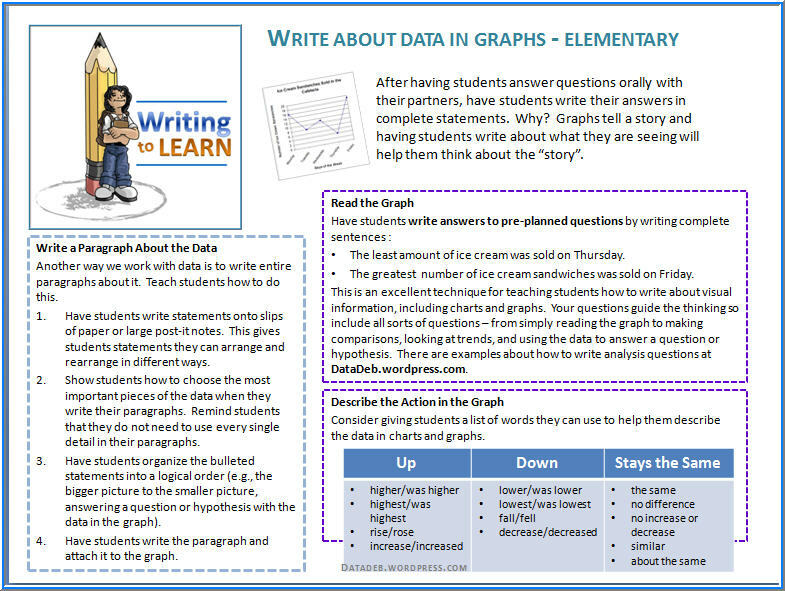 Download the overview sheet and examples of having elementary students write about data. 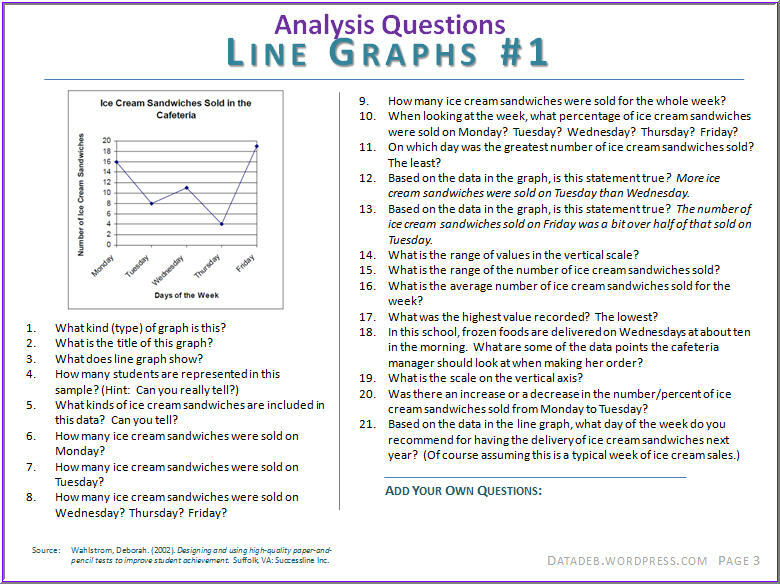 In this pdf, I’ve included examples of analysis questions for two different line graphs. Both of these are for the elementary level. For each set of questions, I’ve also included a large size of the graph that you can project and/or give students as they work to answer these questions. Download the pdf of the Analysis Questions for a Line Graph. Remember the Success Sequence: Draw, Talk, Write. Have the students use the visual and talk about the answers – preferably in a structured way as you call out the question. Then have students write about the graph. This content card is for the elementary level. The content card shows the parts of a line graph, ideas for comparing data, the definition of a line graph, and common words for describing the amounts in a graph. 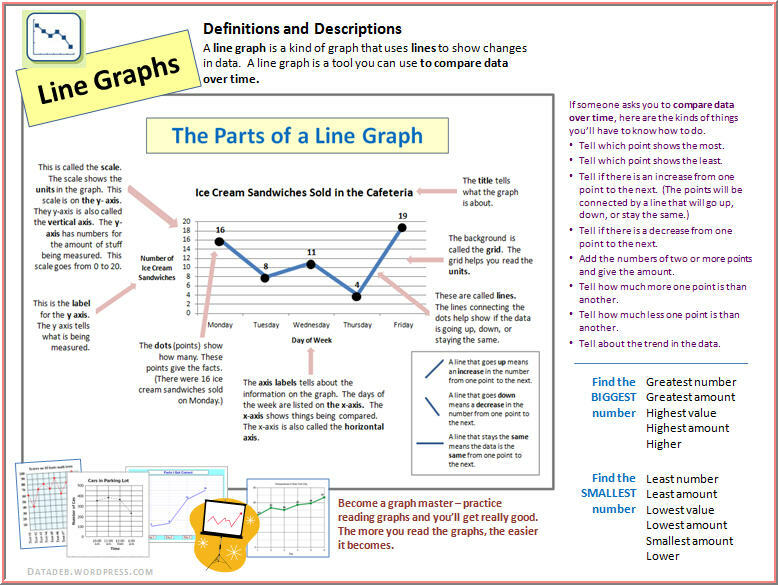 Download this two-page content card for line graphs. This content card is designed for elementary school students. If you like this one, just let me know and I’ll add to the content for middle and high school students. Download the bar graph content card in pdf format. One part of unpacking standards is clarifying what it is we want students to learn. It is not enough to simply look at nouns and verbs in curricular statements; we’ve got to go beyond that and figure out the specific content that students must learn. One way to do this is to make a content card using Frayer’s Model for vocabulary development. The idea of using the model is to figure out the key content students should learn for a standard. The visual below is a content card that I finished today. Download a copy Content Card, Scatterplot. To get to the information for the card, I reviewed the following for a standard from the Commonwealth of Virginia: Standards of Learning for Mathematics, Curriculum Framework, Enhanced Scope and Sequence, and Released Assessments. I enjoy working with these and I’ll continue to post any that I do.